This is a freebie from one of my products. 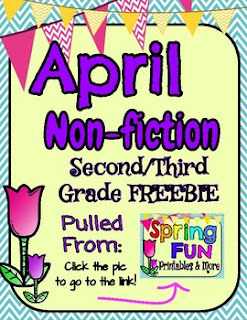 This freebie is composed of two reading selections. Each of them are nonfiction. One is all about the history of jelly beans and the other is about rabbits. These will get your young readers thinking! Check out the other sheets in this packet (Spring Fun!) They are all geared for first, second, and third graders. Here is the link to Spring Fun!